United Church of Christ - Our denomination's national website. The Central Atlantic Conference - Our regional denominational office. 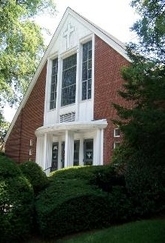 The New Jersey Association - Our local denominational office and resource center. Ask the Question - What am I going to do with my life? How can I make a difference? For what purpose was I created? Am I called to be a minister in the United Church of Christ? If these are the kinds of questions you have found yourself asking, then this website is for you. Here you will find resources to help you on your journey of exploration. UCC Take Action - Our denomination's way of providing you with an opportunity to have your voices heard to our local, state, and national legislatures. Here, you can add your name to various petitions that are mailed or faxed to your respective leaders.